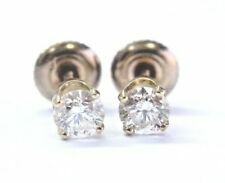 Here is a Fine Round Cut Diamond Stud Earrings. Made from Solid 14Kt Yellow Gold and weighs. 9 grams. It holds Two Natural Round Brilliant Diamonds that are VS2 Clarity G Color that adds to. 50Ct. Ladies Necklaces. Browse All Ladies Chains. Ladies Pendants. Quality Diamond Jewelry For Less. Diamond Chains. Heart Shape Pendants. An exquisite pair of earrings crafted in10K Yellow Gold. 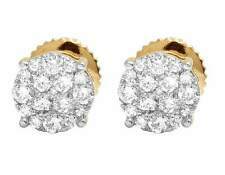 The earrings have0.40 ct of diamonds set on a6 mm surface. Ladies Necklaces. Browse All Ladies Chains. Ladies Pendants. Quality Diamond Jewelry For Less. Diamond Chains. Heart Shape Pendants. Three-Piece Trio Sets. Feel like a celebrity wearing these dazzling diamond cluster earrings crafted in 14K Yellow Gold and showcasing1.25ct of high quality diamonds. Each earring has VS2-SI1 clarity princess cut diamonds invisibly set. Princess Cut (Square). Quality Diamond Jewelry For Less. Diamond Chains. Heart Shape Pendants. Three-Piece Trio Sets. Custom Diamond Pendants. 18K Yellow Gold Wt :- 2.74 gm. Diamond Wt :- 0.30 Ct. All the designs are handcrafted and manufactured in our in-house production unit. We decorate our Gold and Silver jewelry pieces with Precious & Semi-precious Gemstones and Natural Diamonds. Ladies Necklaces. Browse All Ladies Chains. Ladies Pendants. Quality Diamond Jewelry For Less. Diamond Chains. Heart Shape Pendants. Three-Piece Trio Sets. Custom Diamond Pendants. A stunning pair of studs featuring exquisite canary diamonds in a fascinating cluster. Crafted in warm10K yellow gold, this pair features alluring canary diamond in a10MM flower-shaped cluster. Screw back closure for secured fit, this gorgeous earringsweighs approx 2.4 grams. 14K Yellow Gold Wt :- 0.45 gm. All the designs are handcrafted and manufactured in our in-house production unit. We decorate our Gold and Silver jewelry pieces with Precious & Semi-precious Gemstones and Natural Diamonds. Elegant and charming, these gorgeous square diamond studs are crafted in14K Yellow Gold and showcasing1.10 CT of high-quality diamonds. Each earring features a cluster of hand selected round diamonds pave set on an attractive square front. Princess Cut (Square). Quality Diamond Jewelry For Less. Heart Shape Pendants. Diamond Chains. 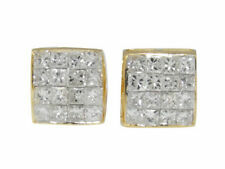 Diamond stud earrings are a classic - truly a must have. But these are even lovelier! An amazing surface of sparklingVS2-SI1 clarity diamonds. 14K Yellow Gold Wt :- 0.68 gm. Diamond Wt :- 0.23 Ct. Item Code :- SE-1058. Diamond Clarity: VS2. Shape: Round. Main Stone: Genuine Diamond. Total Carat Weight: 0.60CT. Size :-star 8mm, moon 8x2 mm. 14K Yellow Gold Wt :- 0.49 gm. Diamond Wt :- 0.13 Ct.
A stunning pair of studs featuring exquisite canary diamonds in a fascinating cluster. Crafted in warm10K yellow gold, this pair features alluring canary diamond in a6.5 MM flower-shaped cluster. Screw back closure for secured fit, this gorgeous earringsweighs approx 1.56 grams. DIAMOND COLOR : YELLOW. DIAMOND WEIGHT : 2/0.30 CTS. DIAMOND CLARITY : VS2. Our products are from all over the world. SETTING : PRONG. DIAMOND COLOR : YELLOW. DIAMOND WEIGHT : 2/0.16 CTS. DIAMOND CLARITY : VS2. Our products are from all over the world. SETTING : PRONG. Main Stone Clarity: VS2 - SI1. Main Stone: Genuine Diamond. Diamond Color: H - I. Shape: Round. Total Carat Weight: 1.20CT. Size :-heart-8x8 mm, moon- 10x1 mm. 14K Yellow Gold Wt :- 0.46 gm. Diamond Wt :- 0.15 Ct.
Feel like a celebrity while wearing these dazzling diamond flower cluster earrings crafted in14K Yellow Gold and showcasing0.52 CT of high-quality diamonds. Each earring features a cluster of hand selected round diamonds set with white prongs in the center creating a beautiful flower thus bringing the entire setting to6mm. These diamond earrings are perfect for a baby and make a wonderful newborn gift! These diamonds have lots brilliance, fire and sparkle. These earrings are available in white gold as well. 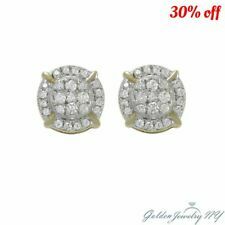 Yellow Gold Screw Back Natural Round Cut Diamond Studs Earrings 1/5 CT F VS2. This beautiful pair is sparkling with0.53 CT round cut diamonds. These diamonds areVS2-SI1 clarity withG-H color. The diamonds are held in place with white gold prongs in an attractive pattern thus giving the earrings their incredible look. This piece is finely crafted in Pure 14k Yellow Gold. - Earrings Size (MM) - 8 x 8. - Main stone: Diamond. - Diamond Clarity: VS2 - SI1. - We also thrive on making unique designer pieces from scratch based on your vision and design. Opal Gemstone Wt :- 4.97 Ct. Diamond Wt :- 0.41 Ct. All the designs are handcrafted and manufactured in our in-house production unit. We decorate our Gold and Silver jewelry pieces with Precious & Semi-precious Gemstones and Natural Diamonds. Certified Diamond Information. 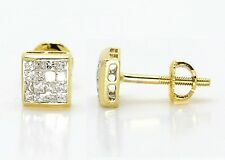 Diamond stud earrings. Total Carat Weight. Jewelry Type. Gram Weight. Diamond Information. . Photos have been enlarged to show detail. These luminous cluster flower earrings are beautifully crafted in 10K Yellow Gold, and encrusted with0.33 carat ofgenuine diamonds, dazzles like beautiful stars in the night sky featuring a diamond in between and 6 diamonds surrounding it, each of them boastingH-I color andVS2-Si1 clarity in a5MM wide floral pattern. Princess Cut (Square). The earrings features magnificent princess cut diamonds totalling0.50 ct set over a square surface. Each diamond is of VS2-SI1 Clarity with a F-G color and are all matching in color and clarity.